So far in this series of articles on overcoming fear, we've explored how each fear can be traced to a fear of death and also, how our 'web of identity' affects the way we approach our fear. Now, let's go deeper still into the caverns of who we are and look at the source pain behind our fear of death. Whether a final death or an every day challenge to our sense of self, it confronts our identity causing us to be afraid. Thus we often cling to certain traits/identities within us when others are challenged, especially our world view and belief system. It's been shown over and over again that when reminded of our fear of death, we react generously to those who reinforce our beliefs and harshly to those who call our beliefs into question. The two 'flows of consciousness' conflict because of fear - we fear to lose ourselves in unity consciousness, to lose our uniqueness, that which defines us. This is the underlying cause: the 'source pain', of our fear of death. It is the reason so many are not able to meditate deeply - to hit that point where we blend effortlessly into the vastness of the universe. So how do we consolidate these two apparently opposing flows so that they work together in our lives, so that fear arises less and less? Well, I'm afraid there's no method I can give you. The answer lies in the opposite of method - surrender.....total and utter surrender. We have to let the fear arise. We have to make friends with it. We have to let go of our clinging. We have to be prepared to dissolve into nothingness. It takes a deep surrender to let go of our identities. The parent, the musician, the football player, the intellectualist, the lover, the carer, the comedian, the warrior - they must all go. They have to all be thrown into the black hole of nothingness - to my knowledge there is no other way to overcome fear! We have to literally become the black hole. Emptiness. Here's the thing - this emptiness, this nothingness. There is actually a wholeness to it. A purity of life. Some call it unconditional love. It is not really nothingness but no-thing-ness. There is no object (there is not even a subject) to cling to and produce duality... ...and out of this nothingness, this pure potential, comes our real uniqueness. It is not something that can be easily described, easily labelled, and therefore there is no identity with it. It is just you, pure and simple. It is felt as a kind of 'rightness' in every moment. It is not the rightness of right and wrong, this is a judgement, a duality which leads to identifying with a certain point of view. It is a spontaneous 'knowing' of how to respond to any given situation. It is beyond the mind and yet it is alignment for you and those around you, even if it makes people uncomfortable. Life is truly magical - the way it works, all the little miracles, the coincidences, the interactions. How can we cultivate this feeling inside of us? We have to dive right in. Embrace the good and the bad. Find a passion, what makes you tick and do it without guilt. Dive right in. But don't cling, don't identify - our passions are simply ways of expressing our uniqueness which comes form pure potential, they are not who we are. We are the magic of the universe made incarnate. 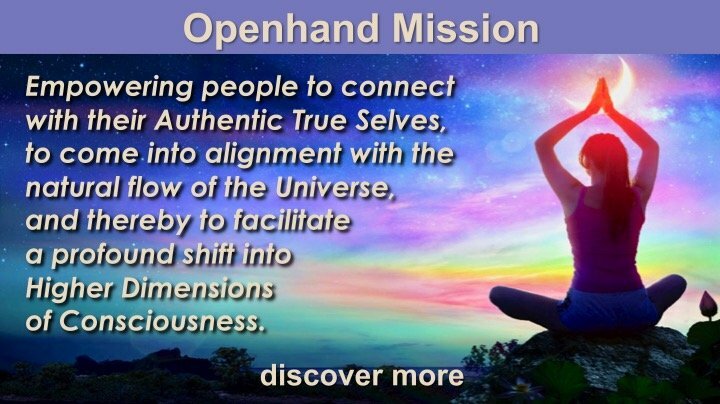 Richard is a spiritual facilitator with Openhand. He is a carer, psychologist, spiritual coach and writer. He has worked close to death for 7 years and is passionate about helping people to move on in a conscious way, even though society is geared to fight against death. He offers services in Spiritual Facilitation and Conscious Dying on his website Back to the Source and writes regular articles on his blog. Great article Richard - thanks for sharing. Yes I agree, so often its the subconscious fear of death that often prevents people in society from stepping out and taking the risk to truly be them. Often this is stored in people's karma from what's happened in past life experiences where society persecuted people for doing this. Confronting the fear of death is an extraordinary liberating thing to do. Hi Richard, great to 'read' you. I very much resonated with your words here. Wow 'we have to literally become the black hole' thank you friend. Do people really want to hear that I wander? I don't think many embark on the spiritually journey and willingly trade something for nothing. There seems to be quite a scramble on the path to replace what is felt to be lost by more identifiers - and you can't blame anyone for that. We dance around the edges of the black hole in many guises of fear. And like you say the nothingness alchemises into fullness once the fear is transcended. For me it's like trying to go through the eye of the needle - there are prerequisites, one being to surrender fully to death. But are people willing to die unto themselves? I won't write more because the fire gets strong and I'll over energise ;) but just wanted to say thanks - great insights delivered in a way that's gentle. Hi Open, Amy and Katie. Thanks for all your lovely responses! Amy - haha, thanks for all the love. I feel it. Thank you for sharing your experience with loss of identity. It really can strike at any time can't it. For me, that's all that dying really is - a loss of identity. That's why it's so hard when someone experiences something like what you've shared. It's literally a death. Much love sister Andromeda! Katie - Thanks for your words - great to 'read' you too! ;) Your observations ring true. As you said it's understandable because of the pain felt from the initial loss of identity. I guess what I'm describing here is the dark night of the soul. That period between losing identity and becoming the fullness of non-identity. At the moment, I am trying to reach people who are already in this process and looking for help. Otherwise, it's difficult to build up the motivation, particular with so much fear. But, I'm trying to also get the message across that embracing death makes life so much richer. It's a tricky balance. Thanks for your insights. By the way, for anyone who's interested. This article is a small preview of a book I'm writing at the moment about coping with change and loss of identity. Thank you for a brilliant article, it's awesome - full of gems! Thanks for the share. Although the one you posted is actually called 'Follow the Heron' -which by the way is a beautiful song. Great article Rich and perfect timing. In a very recent dark night of the soul, under attack with thoughts and feelings of mortality the light came on only when I remembered my earliest memory - the fall from unity into separation. It was accompanied by deep sadness yet, many years later separation now so obscures that reality. I am blessed to have that memory. Now I enliven it with attention - the eye of a needle beyond the filter of separation. Your words put what was not really into though for me into full view. Wow Jane, thanks for sharing your own experiences with this dark night. How amazing to have that memory - what a gift and yet I'm sure quite painful too. So many beautiful nuggets in your article. Thank you. It stimulates me to feel more deeply into the paradox of Pure Presence as being both everything and nothing. Beyond all judgment. All attachment. All identity. I frequently hear people say, "God is Love. I am Love." If one attaches to love, how can one be present in the midst of hate without judging it? If we attach to any identity, how can we truly be One with All That Is? Pondering the mystery and magic of the divine as being present in all things, yet not being any of those things, helps to dissipate the fear of diving into that black hole of nothingness. Contemplating that the divine is in both the love between the child and the mother, and in the hate between the father and the son, expands the love in my heart to no end, understanding love as an expression of the One. The only way to be One with everything is to be nothing because the moment we identify with something, we separate ourselves from everything. Mind blowing to feel into this. Ah, the wondrous grace of Pure Presence, both everything and nothing. Love your words as always - you always have so much to bring to the table. You said "The only way to be One with everything is to be nothing because the moment we identify with something, we separate ourselves from everything. Mind blowing to feel into this"
Yes indeed, it's really all about identity. If we can move beyond identity, then death no longer touches us as there's no longer anything to lose - just a continuous flow of unique consciousness. I won't pretend that I've got all this completely sorted myself yet - still identifying with certain aspects. But, the more identity is transcended, the clearer pure presence becomes. Mind blowing indeed! Open, you told me to soften in Helsinki. This afternoon I'm feeling very anxious and increasingly vulnerable. I'm trying to find myself, contemplating my will and consciousness. I also really feel in need of help, comfort at least. Is the softening you spoke about, the same as opening the heart? Kristian, I felt drawn to share with you a poem by David Whyte, which has been a great comfort to me. Whyte's words have been a remarkable gift in my life and I would like to share these powerful words with you. is a word that tempts us to think outwardly, to run bravely against opposing fire, to do something under besieging circumstance, and perhaps, above all, to be seen to do it in public, to show courage; to be celebrated in story, rewarded with medals, given the accolade, but a look at its linguistic origins leads us in a more interior direction and toward its original template, the old Norman French, Coeur, or heart. Courage is the measure of our heartfelt participation with life, with another, with a community, a work, a future. To be courageous, is not necessarily to go anywhere or do anything except to make conscious those things we already feel deeply and then to live through the unending vulnerabilities of those consequences. To be courageous is to seat our feelings deeply in the body and in the world: to live up to and into the necessities of relationships that often already exist, with things we find we already care deeply about: with a person, a future, a possibility in society, or with an unknown that begs us on and always has begged us on. Whether we stay or whether we go - to be courageous is to stay close to the way we are made. from Readers' Circle Essay, "Courage"
Hang in there buddy. It sounds like you're moving into the flames of a transformational experience. A kind of re-birth perhaps. Vulnerability is the way through this - I'm getting an ever increasing sense of this these days. Vulnerability is really the key to our unfolding. So, I'd just like to encourage you to stay with it, if you can. Softening may mean different things to different people, but for me it involves first relaxing the body as much as I can around any uncomfortable sensation or emotion. This is usually done through awareness and breath. You can also balance going right into the discomfort with reminding yourself that you are beyond that. You are infinite presence, felt as a kind of emptiness, pure potential inside. When you connect with this then it's possible to stay present with your bad feelings but without really suffering from them. There is no longer an identity created around them. I guess this is what Open means when he says 'soften and expand'. If you are feeling this void and not knowing who you are, or how to express yourself from it, then I can help with that. If you feel to then get in contact and we'll work through it. Hey you guys, thank you so much for your dear support, it was felt here <3 That nourished me.